CEOs earned $12.9 million on average in total pay last year -- 380 times more than a typical American worker, says the AFL-CIO. WASHINGTON (CNNMoney) -- Chief executives at some of the nation's largest companies earned an average of $12.9 million in total pay last year -- 380 times more than a typical American worker, according to the AFL-CIO. Average CEO pay rose 14% compared to 2010, when they earned $11.4 million on average, according to the union group. The AFL-CIO each year highlights the pay disparity between workers and chief executives from companies that are part of Standard & Poor's 500 stock index. "All employees create value. CEO pay levels should be more in line with the rest of the company's employee pay structure," said Richard Trumka, AFL-CIO president. "CEOs should be paid as a member of a team, not as a superstar." The labor group unveiled an updated website database compiled from 300 companies based on filings with the U.S. Securities and Exchange Commission. The union group uses the Bureau of Labor Statistics wage data to define typical worker pay, which was $34,053 for all occupations last year. The data are searchable on the website paywatch.org, which is run by the union group. The site will eventually post CEO pay for all 500 companies as that data is released in proxies submitted to the SEC. In 1980, CEOs at the largest companies received 42 times the pay of the average worker, according to the union. In 2000 the gap hit a high, with CEOs making 525 times the average worker. In 2010, the gap narrowed, with CEOs making 343 times the average worker. Trumka himself makes roughly four times the average worker. The union group's 15-year old website was updated this year to reflect new laws that went into effect in 2011 requiring publicly traded firms to hold nonbinding shareholder votes on executive pay packages. 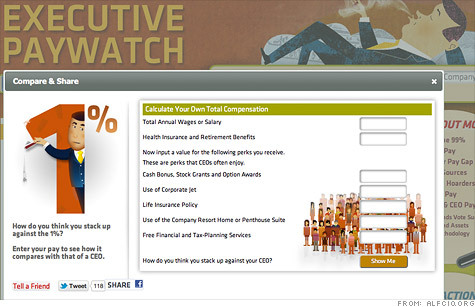 The site allows users to look at how mutual funds and investment firms voted on executive pay packages in 2011. So far in 2012, investors voted against pay packages at 4 companies, including the $15 million pay raise for Vikram Pandit at Citigroup (C, Fortune 500). Last year, investors voted against pay packages at 40 companies. "Shareholders are beginning to protest," Trumka said. "Investors now have the ability speak out on outsized CEO pay packages on say-on-pay votes." Trumka also called upon the SEC to implement another law highlighting executive pay, which passed in 2010 as a part of Wall Street reforms. The SEC has yet to detail how publicly traded firms should disclose and compare CEO to employee pay at individual companies. Calls for comment to lobbying groups that represent chief executives were not immediately returned. Obama won't attack private equity?